The European Green Party looks to have won 55 seats, up 11 seats from 2009, and the best result for Green parties in European elections ever, while many new and small parties also potentially could end up in the leftist group. 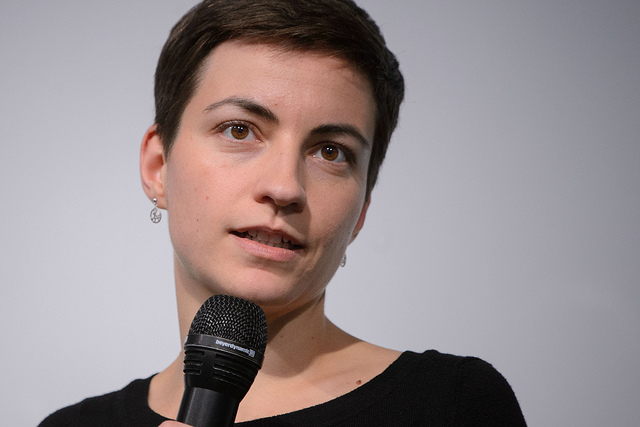 The Greens’ Spitzenkandidat, Ska Keller, addressed Parliament after the election results, saying that they reflect a good outcome. “The green message is spreading also to countries where we didn’t previously have representation because we have had good candidates all over Europe,” Keller said. Talking about the Commission presidency, Keller said the next head of the EU’s executive should be someone who has run as his or her party’s top candidate in the last months. Earlier Sunday, Keller said that the Green party ‘would certainly want to talk to Juncker’, the European People’s Party’s (EPP) candidate. “We Greens only give votes to a candidate who also supports Green priorities,” Keller said. Shortly before the official results were announced Sunday evening, Rebecca Harms also spoke to EURACTIV Germany, and stressed that the Greens had been wrongly written off. “We had a considerable headwind and then everything in the last few weeks revolved around the Schulz-Juncker duel. And we still won additional votes. That shows one thing: There is still an awareness that there needs to be a force in Europe to represent ecological responsibility beyond our generation,” Harms stated. The biggest victory for the Green group on Sunday night looks to come from Sweden, where the Environment Party became the second-biggest, securing 15.2% of the votes, but the Greens also got a surprisingly good result in the UK. Meanwhile, new parties such as the German Pirates and the Swedish Feminist Initiative are parties which could potentially go to the Green group. Between 22 and 25 May, European citizens elected a new European Parliament, made up of 751 members. For the EU executive however the 27th May will be the decisive date, with EU heads of states meeting in Brussels to designate the new Commission President. In Parliament, the designated Commission chief will need the backing of at least 376 MEPs in order to get "elected". Most likely, a grand coalition will support the winning candidate - Jean-Claude Juncker. A coalition of socialists, liberals, greens and the far-left could provide Schulz with a majority but polling shows that this is highly unlikely. Need more young people like Ska in politics not some of the old tired gits that we see time after time (plus the old tired ideologies). Not only Ska , Mr Parr !! The Greens ,Liberals, Sozialists and the EPP have to unify in ONE coalition together against far right “ebola demographic” stupidity which faces threat to Europe !